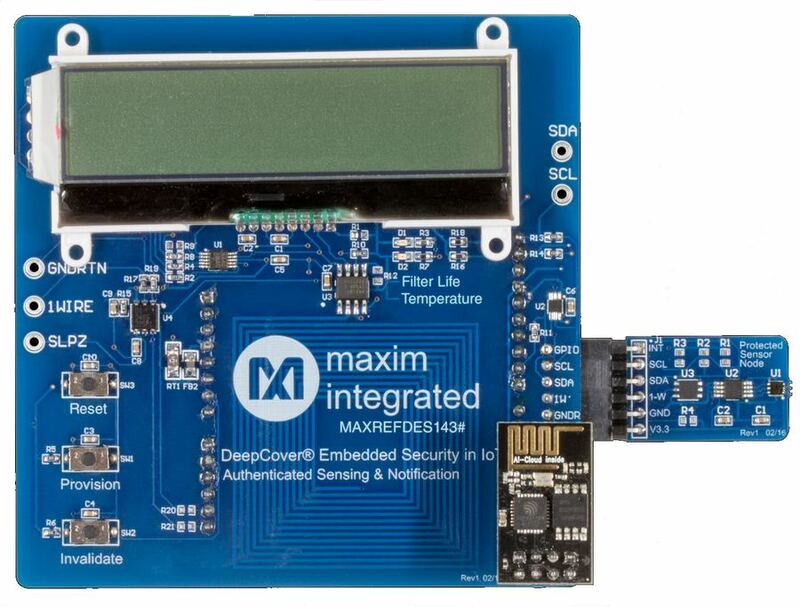 The MAXREFDES143 is an Internet of Things (IoT) embedded security reference design, built to protect an industrial sensing node by means of authentication and notification to a web server. The hardware includes a peripheral module representing a protected sensor node monitoring operating temperature and remaining life of a filter (simulated through ambient light sensing) and an mbed shield representing a controller node responsible for monitoring one or more sensor nodes. The design is hierarchical with each controller node communicating data from connected sensor nodes to a web server that maintains a centralized log and dispatches notifications as necessary. The mbed shield contains a Wi-Fi module, a DS2465 coprocessor with 1-Wire master function, an LCD, LEDs, and pushbuttons. The protected sensor node contains a DS28E15 authenticator, a DS7505 temperature sensor, and a MAX44009 light sensor. The mbed shield communicates to a web server by the onboard Wi-Fi module and to the protected sensor node with I2C and 1-Wire. The MAXREFDES143 is equipped with a standard shield connector for immediate testing using an mbed board such as the MAX32600MBED#. The simplicity of this design enables rapid integration into any star-topology IoT network requiring the heightened security with low overhead provided by the SHA-256 symmetric-key algorithm. Note: Programming the MAXREFDES143 requires a separate purchase of a MAX32600MBED development platform or equivalent Arduino Form Factor platform. There are notifications to the user through the web server when intervention is required such as when it is time to change the consumable being monitored (i.e., the protected sensor node), a filter in this case, or if an unsafe consumable (i.e., counterfeit sensor node) is installed. The simplicity of this design enables rapid integration into any star-topology IoT network requiring the heightened security with low overhead provided by the SHA-256 symmetric-key algorithm.